A late addition to World War II, the P-61B Black Widow was designed specifically for night fighting. Night bombing during the London Blitz of 1940–41 demonstrated the need for appropriate countermeasures to combat the Luftwaffe campaign against England. Although the Black Widow did not see action until 1944, it was incredibly advanced for its time and helped contribute to future aircraft design. Even during World War II, night combat was rare as no effective means of identifying enemy positions were available to commanders. The invention of radar changed this reality, allowing commanders to see enemy aircraft before they reached their target. The Black Widow was one of the first aircraft to be equipped with this new technology. Large fuel tanks allowed for several hours of loitering. Armed with four 20mm cannons and four dorsal-mounted .50 caliber turret machine guns, the Black Widow found success when it engaged enemy aircraft both in the Pacific and over Europe in 1944–45. 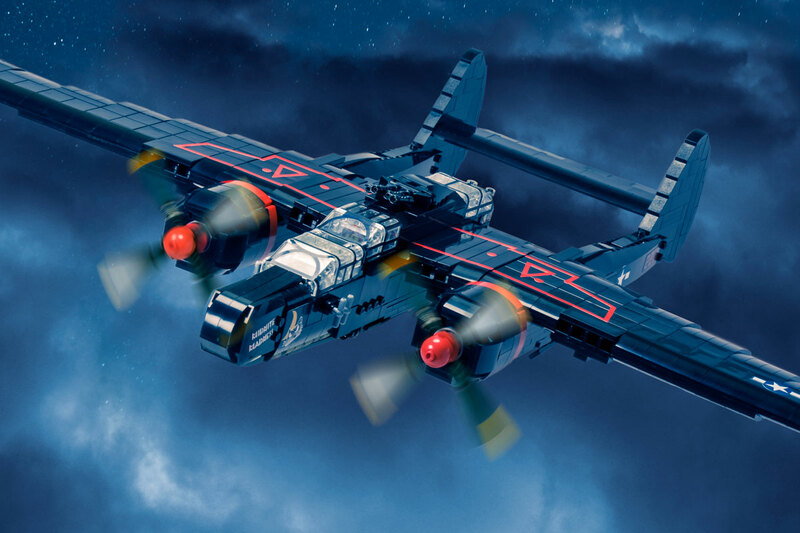 The Brickmania model features several of the unique components seen on original Black Widows, including the rotating dorsal turret with four machine guns, moveable flaps and elevator, aircraft markings including nose art, and the signature sleek black design. It also includes three custom-printed minifigures to crew your new night fighter.